Fascinating report from the US Department of Education. First: top quality advisors, people like Richard Clark and Dexter Fletcher, who know research methodologies. Second: scope, going from 1996 to 2008. Third: rigorous, clearly identifying measurable effects, random assignment, the existence of controls and ignoring teacher perceptions. “Instruction combining online and face-to-face elements had a larger advantage relative to purely face-to-face instruction than did purely online instruction. An interesting little observation, tucked away in the conclusions is, “one should note that online learning is much more conducive to the expansion of learning time than is face-to-face”. In other words it’s better at getting learners to continue learning after the event. What more can you ask for? 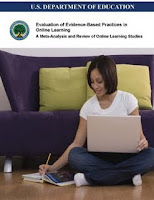 Some extremely useful and interesting information regarding value of online and blended learning which will assist in planning for those organisations exploring contemporary developments in learning methodologies and technologies. Can this report be accessed generally ? Sorry, link is now in post. Report freely available. In what way does “Instruction combining online and face-to-face elements had a larger advantage relative to purely face-to-face instruction than did purely online instruction" constitute "Jury out on blended"? Hi Clive - in the report tey explain that the variables were all over the place so that true evaluation was not really possible. I'm sorry it's taken me a month to find your take on the report. I came to it after reading a lot of chatter about how this report 'proves' that on-line learning is more effective than face to face when quite clearly it doesn't! My concern is that the researchers seem to be comparing contemporary on-line methods with traditional teaching methods. Although I do appreciate that full, rigorous research is thin on the ground and that this meta-analysis was working with the best studies they had available. My declared interest is that I design and delivery business training workshops and have an strong interest in using web technologies to support and extend the face-to-face environment. I've read your blog post and your warnings about the conclusions are fair. However, I'm not sure that this let's face-to-face learning off the hook. 1. BECTA, having looked at teachers in schools confirmed that 'talking at students' is quantifiably still an over-used and dominant method of teaching. 2. In Higher Education the uninterrupted 50 minute lecture is still the norm. 3. I agree that training is more sophisticated - but it's patchy - look at the nonsense of NLP, flipchart training for affective learning and so on. Remember that this is an 'Educational' report from the US Department of Education, not a 'Training' report. I recently commented on another blog too on the same lines... I think that online means alone can not have the impact as a student teacher f2f interaction.